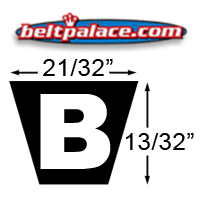 B62 Classical V-BELT, 65" Length O.C. 21/32" Wide (Approx. 5/8"). Industrial Grade BANDO POWER ACE. High quality for low cost! 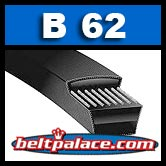 Browning-Gates-Goodyear B62, BP62, 5L650-K Belts. NAPA, Grainger, PIX (low grade) B-62.